Cleaning the house is not the most exciting thing to do but it is a necessity! One room in the home people tend to spend a lot of time in is the kitchen. It’s where families and friends come together for one to three meals a day and the occasional snacking in between meals. Not only for eating, it seems people tend to gather in the kitchen more frequently at parties than any other room in the house. There’s something about food and a kitchen countertop that just brings people together. As nostalgic as that may sound, it’s also a reality that the kitchen and kitchen countertop needs to be kept clean and as germ-free as possible for everyone to stay healthy. Kitchens tend to be a breeding ground for all kinds of germs and bacteria, mainly when prepping raw meat, dairy, and eggs. If the counters aren’t disinfected properly, Salmonella and E. Coli can find a cozy home and can cross-contaminate breads, fruit, veggies, which can cause people to get very sick. With so many cleaning products on the market, it can be difficult to determine what the best course of action is for getting rid of germs and bacteria. Luckily there are many eco-friendly and organic options that will not only clean your kitchen but also reduce the amount of chemicals left on your granite countertops. Seventh Generation products are ideal for cleaning a kitchen effectively and quickly. The products are not very expensive either which is another bonus! 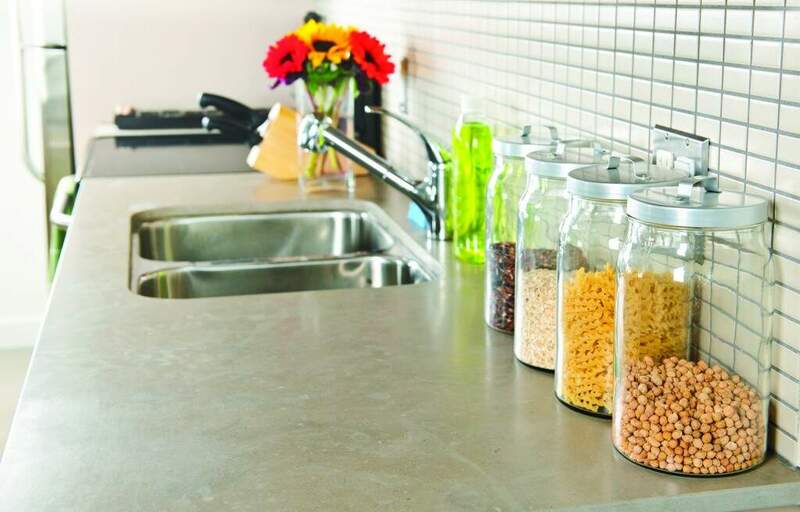 All of their products, including kitchen cleaning products, contain no dyes or synthetic fragrances, are BPA-free, and are free of chronic toxicants. One of their top-selling kitchen cleaning products is their Disinfecting Multi-Surface Cleaner. It kills 99.9% of household germs botanically and naturally including Influenza A virus, H1N1, the Common Cold virus, Salmonella, and E. coli. Combine the Seventh Generation Multi-Surface Cleaner with their 100% Recycled Unbleached Paper Towels and you have a winning combo of cleaning power and eco-friendly. Essential oils not only smell beautiful but clean and disinfect the kitchen beautifully as well – and a little goes a long way! Essential oils are incredibly potent as well as 100% natural and this makes them ideal for the kitchen. Please note: Never use essential oils without mixing with a carrier oil or water to dilute the solution. Though natural, essential oils can be harmful if not used properly and safely. Combine 7 drops of each essential oil with 2 cups of water to spray on surfaces and wipe away unwelcome germs and bacteria: lavender, tea tree, eucalyptus, grapefruit, oregano, cinnamon, clove, thyme, and pine. Mix 10 drops of orange or lime essential oil with ¼ cup white vinegar then add to a bucket of clean water. Add Seventh Generation Liquid Dish Soap, and mop away dirt and germs! Cleaning the kitchen with natural products will not only leave everything sparkling clean, it will also give you the peace of mind knowing harsh cleaning chemicals were not left anywhere in your kitchen.